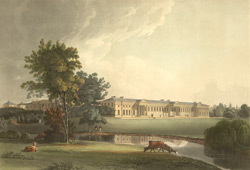 Artist and engraver: Medland, T.
View of Haileybury College in Hertfordshire. The college is situated on Hertford Heath and it was founded in 1809 as a training centre for newly recruited cadets working for the East India Company. It was Lord Wellesley who first established a school of this kind in 1800 for new recruits however this school was not accepted by the court and instead they opened Haileybury College. All recruits had to attend the college for four years for moral, physical and intellectual training. The classes were planned around the syllabus of Oxford and Cambridge Universities and in addition the recruits were taught the Indian language and the history of the country. The college was closed in 1858 but reopened in 1862 as a private school. The architect of the fine building at Haileybury was William Watkins who also designed the National Gallery in London.